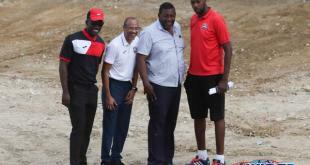 The Trinidad and Tobago Women’s National Senior Team dominated proceedings at the Ato Boldon Stadium in Couva this evening but were forced to settle for a 3-0 win against a dogged Dominica outfit. 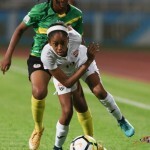 Central defender Jenelle Cunningham opened the scoring after just five minutes with a rising strike into the roof of the net from close range. 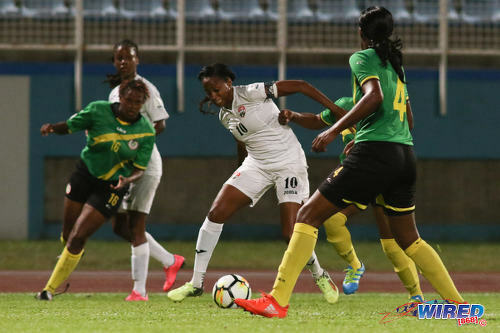 But the floodgates never opened, as Dominica—coached by former Trinidad and Tobago women’s youth coach Rajesh Latchoo—remained disciplined and resilient behind the ball. 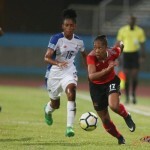 Photo: Trinidad and Tobago captain Tasha St Louis (centre) tries to find space against a dogged Dominica backline during 2019 World Cup qualifying action at the Ato Boldon Stadium on 21 May 2018. 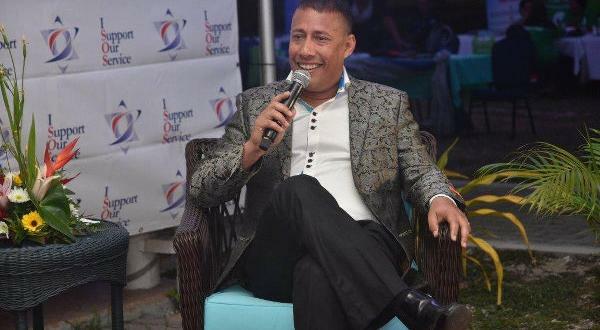 Dominica failed to register a single shot at the Trinidad and Tobago goal but, at the other end, often restricted the Women Soca Warriors to long-range efforts, packing players into their own penalty area. 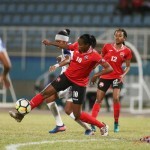 In the end, all three Trinidad and Tobago goals came from set pieces as another central defender, Rhea Belgrave, bundled in the hosts’ second item in the 36th minute. And Karyn “Baby” Forbes crashed home another effort from distance, scoring direct from a free kick in the 54th minute. 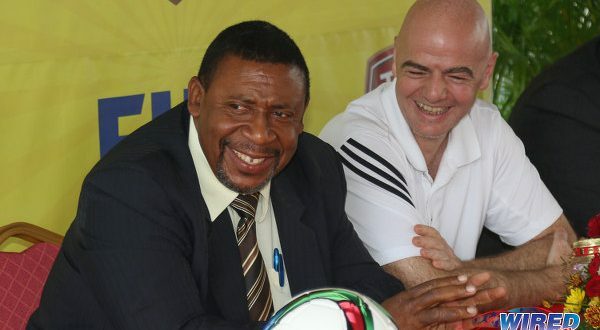 Trinidad and Tobago have a rest day on Wednesday but they return to action from 6:30pm on Friday 25 May against St Kitts and Nevis at the same venue. 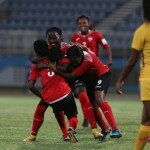 Trinidad and Tobago (3-4-3): 1.Saundra Baron (GK); 4.Rhea Belgrave (3.Anastasia Prescott 68), 2.Ayanna Russell, 5.Jenelle Cunningham; 8.Patrice Superville, 11.Janine Francois, 14.Karyn Forbes (19.Aaliyah Prince 70), 7.Jonelle Cato; 12.Summer Arjoon, 10.Tasha St Louis (captain), 9.Mariah Shade (18.Naomie Guerra 78). Unused substitutes: 20.Nicolette Craig (GK), 6.Natasha St Louis, 13.Andrea Young, 15.Taylor Mims, 16.Kedie Johnson, 17.Shaunalee Govia. 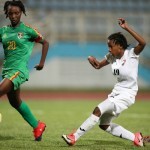 Dominica (5-3-1-1): 12.Kimberly Elei (GK); 20.Alanna Finn (17.Keanna Francis 63), 14.Kylee Bertand, 6.Kira Bertrand, 4.Kimara Sabaroche, 8.Kasika Samuel; 19.Chazelle Phillip, 11.Rosilia Registe (captain), 16.Michlyn Morgan (9.Donisha Xavier 55); 3.Alijah Titre (5.Henrica Samuel 43); 10.Romelcia Phillip. 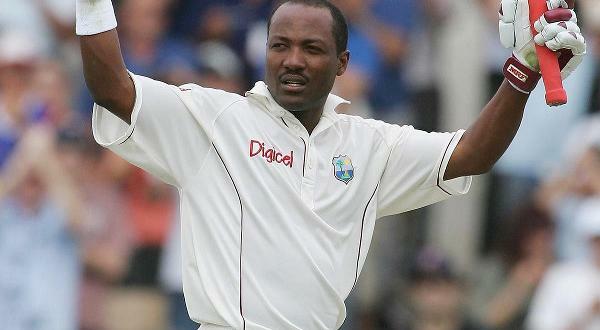 Editor’s Note: Click HERE for full match report with quotes from both coaches.